Degree of anisotropy (DA) is a measure of how highly oriented substructures are within a volume. Trabecular bone varies its orientation depending on mechanical load and can become anisotropic. This plugin uses the mean intercept length (MIL) method for determining anisotropy. Briefly, a large number of vectors of the same length originating from a random point within the sample are drawn through the sample. When each vector hits a boundary between foreground and background, an intercept is counted for that vector. The mean intercept length on that vector is then the vector length divided by the number of boundary hits. A cloud of points is built up, where each point represents the vector times its mean intercept length. Fitting an ellipsoid to the point cloud, construction of a material anisotropy tensor and subsequent eigendecomposition results in eigenvalues which relate to the lengths of the ellipsoid's axes (as the reciprocal of the semiaxis squared) and eigenvectors giving the orientation of the axes. DA is calculated as 1 - smallest eigenvalue / largest eigenvalue (note that due to the reciprocal square relationship, the longest axis has the smallest eigenvalue). New random points with the same vectors are sampled and DA updated with the new MIL counts until either the minimum number of sampling points is reached or the coefficient of variation of DA falls below a threshold. 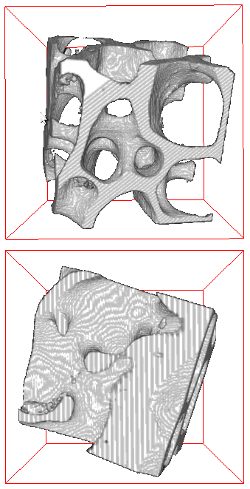 Odgaard A (1997) Three-dimensional methods for quantification of cancellous bone architecture. Bone 20: 315-28. doi:10.1016/S8756-3282(97)00007-0. Harrigan TP, Mann RW (1984) Characterization of microstructural anisotropy in orthotropic materials using a second rank tensor. J Mater Sci 19: 761-767. doi:10.1007/BF00540446. Auto Mode: If checked, Anisotropy will continue to sample the image until a coefficient of variation equal to Tolerance or Max Spheres is reached. If empty, Anisotropy will use Min Spheres and stop. Vector Sampling: distance between subsequent samples along each vector. If subsequent samples have differing foreground/background phases, the boundary count for that vector increases by 1. Tolerance: Once Tolerance, which is a coefficient of variation, is reached, Anisotropy stops sampling in new spheres. Align to fabric tensor: If checked, creates a copy of the input stack whose x, y and z axes are aligned to the fabric tensor of the sample's anisotropic structure. Click on the aligned result in a 3D Viewer window to see the axes of anisotropy. Record Eigens: If checked, will record the eigenvectors and eigenvalue matrices of the fabric tensor to the log window and Results table. DA: Degree of anisotropy (1 - long axis eigenvalue / short axis eigenvalue ). 0 = isotropic, 1 = anisotropic. Eigenvalue and eigenvector matrices as column vectors in the log window. Eigenvectors are represented as V(row, column), and eigenvalues as Dn in the Results table (optional). This file last modified 1326hrs 28 March 2018 © Michael Doube 2004-2019 :: Designed to be interoperable and standards-compliant.